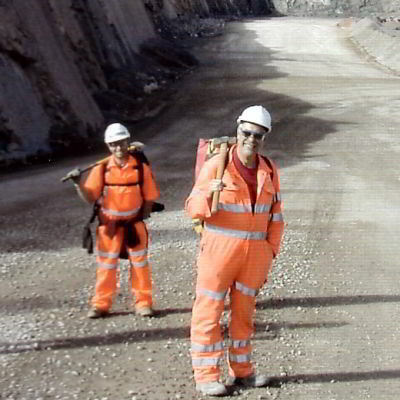 Members on a field trip show the correct attire for entering working quarries. The aims of The Russell Society include encouraging the study, recording and conservation of mineralogical sites and material. The activities undertaken in pursuit of these aims include many field visits to sites around the country. It is of paramount importance to The Russell Society that these visits are planned for and experienced as safe events. It is the policy of The Russell Society, so far as is reasonably practicable, to ensure that health and safety (H&S) issues as applicable to the Society have been and will be properly addressed. In 2015 the Society reviewed its H&S policy and processes, and all H&S documents have been updates in line with this review. All members are encouraged to read and be familiar with all the new 2015 H&S documentation, which can be downloaded from the links below. All members of the Society are to take reasonable steps for the H&S of themselves and others who may be affected by their acts or omissions. All members of the Society are to co-operate with the Society, so far as is reasonably practicable, to enable the Society to comply with any duty or requirement imposed on it. In the event of an accident or injury, members of the Society should seek the appropriate medical attention and notify Society officials who will properly document all details. Any member of the Society can bring to the attention of Society officials any suggestions or ideas which could improve safety and prevent accidents. The Russell Society promotes a high degree of responsibility amongst its members in the achievement of its aims, especially regarding H&S matters. The following H&S documents that can be dowloaded as PDF files. These documents are to encourage enjoyable and interesting visits and meetings that are educational, involve conservation and recording, and are incident free. They also show the responsible attitude The Russell Society and its members have to health and safety issues.